Iperf was developed by NLANR/DAST as a modern alternative for measuring maximum TCP and UDP bandwidth performance. Iperf allows the tuning of various parameters and UDP characteristics. Iperf reports bandwidth, delay jitter, datagram loss. That installed iperf and launched it as a server in the background. Now we need to run the client on the machine we want to test. For this, I created a dead-simple AppleScript wrapper for iperf (which also includes the iperf binary itself), just double-click and enter the address of the iperf server. 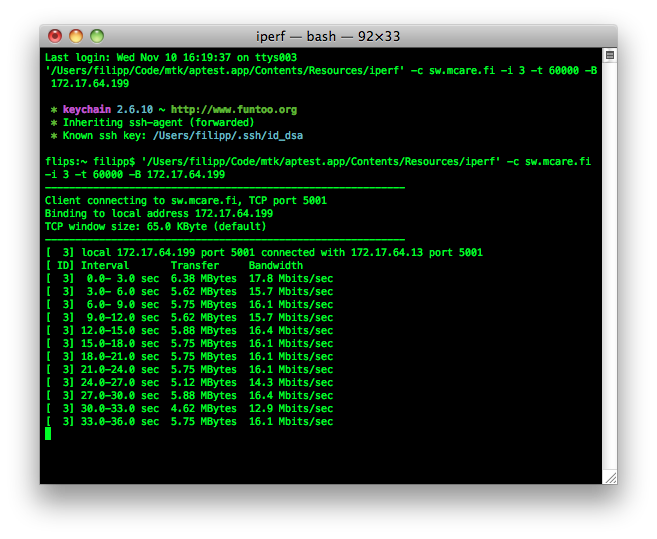 This launches iperf with some options apropriate for long term testing, in a new Terminal window.